What sort of things do you put in your kids' Christmas Stockings? When I was a kid, there were a few things that I found in there every year: chocolate coins, an orange, & a candy cane. I often got a few useful gifts in there too, like underwear or socks, plus a few other small items. 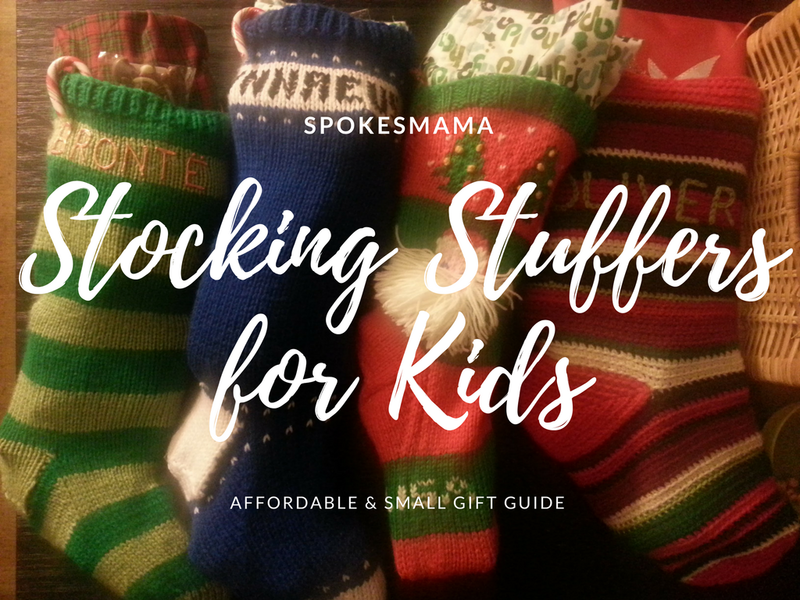 Now that I'm stuffing stockings for my own kids, I like to give them a mix of fun stuff & useful stuff, while trying to stay away from low quality plastic stuff that'll end up in a landfill in a matter of months. But I also don't want to spend a mint on stocking stuffers, so affordable is key. Play Tape--masking tape with roads printed on it that can be put down in different ways, then peeled up & recycled after, great combined with a Hot Wheels car or two. Comes in two widths, lots of colours, & is available in store at Walmart for just $5. Mini Sketchbooks--I generally look at Opus Framing for any art supplies, since the quality is generally so much better. A tiny blank book is portable for entertaining kids at restaurants, or in waiting rooms, & even road trips. Get a 5"x8" book for just $3 at Opus. Bath bombs--if you DIY these there are tons of tutorials online. I bought the citric acid & cream of tartar at Famous Foods for about $8, which will make at least a dozen of them. Or buy ready-made bath bombs at Lush for $6 & up. Reflective bracelets or tags--useful for walking & biking in the darker mornings & aftermoons. MEC has a great selection under $5, but I particularly like the reflective pins made by PoCampo--they're a little more stylish & still only $10 for two of them. Ikea stuffies--inexpensive, cute, machine washable & dryable (both important qualities for children's toys! ), $1-20. I particularly love the SAGOSKATT line which are designed by children: the proceeds go to children's charity focussed on the importance of play. Hope this list helps you save a little time in your holiday shopping. Are you finished yet, or are you more of a last-minute shopper? Have you cut back on the consumerism this year? I'm curious to hear how the holidays are for you. Let me know in the comments below!